ABOVE: Alfresco dining by the lagoon. 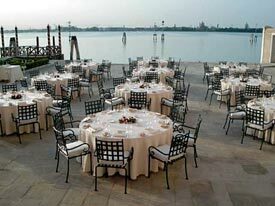 Acquerello Restaurant is the hotel's gourmet dining room, with special emphasis on Adriatic seafood and Venetian cuisine. La Dolce Pool Bar Restaurant & Grill is open from 9 a.m. to 6 p.m. during the warmer months and has an "elegant casual" ambience. The San Clemente Bar is open during the cocktail hour and after dinner for apéritifs, wines, and snacks.